Sprint to Turn iPod Touch Into 3G Mobile Hotspot? 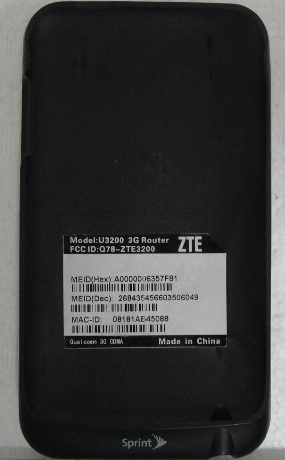 Phone Scoop yesterday discovered new regulatory filings posted by the U.S. Federal Communications Commission showing a new Sprint-branded 3G mobile hotspot device manufactured by ZTE that appears to be in the form of a designed case to wrap around Apple's iPod touch. The Peel, as FCC photos suggest it will be called, seems to be a carriage sled for a tablet style device like the iPod touch. The Peel does not seem to connect to its host device, and it seems to be a specially designed Wi-Fi hotspot device that could offer EV-DO networking to an iPod touch in a package that could be clamped to Apple's Wi-Fi-only iPod. In addition to apparently allowing an iPod touch to connect via Wi-Fi to access the case's 3G data capabilities, the user manual suggests that the Peel would serve much like a traditional 3G mobile hotspot, allowing up to five devices to connect to it to share the Internet connection. The Peel would not be the first time Sprint has tried to tap into the Apple iOS ecosystem to promote its mobile hotspot devices. Earlier this year, the carrier released a television commercial touting its Overdrive 3G/4G mobile hotspot device by claiming that Apple's iPhone could achieve a ten-fold increase in data speeds by connecting through the Overdrive on 4G as opposed to the iPhone's built-in 3G connectivity through AT&T. Soon after the launch of the Wi-Fi iPad in the U.S., Sprint also rolled out a free "4G case" to hold both the iPad and the carrier's Overdrive hotspot device, promoting the package as a way to achieve high-speed mobile connectivity with the iPad and other mobile devices.